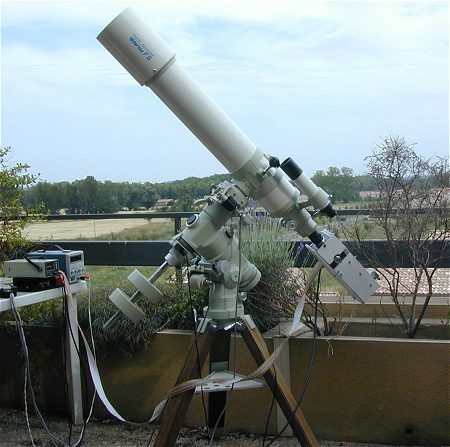 The spectrograph (named MERIS, for MEdium Resolution Imager Spectrograph) is attached directly to a small telescope. We do not use optical fiber to carry light from telescope focus to the spectrograph for a maximal high-throughput. So, the entrance slit of the spectrograph coincide with the focal plane of the telescope. The design is simple, inexpensive and very ease to construct. 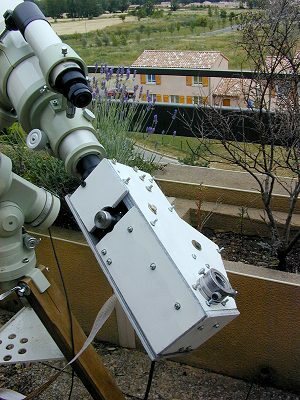 The CCD camera is a 768 x 512 pixels Audine - (KAF-0401E Kodak CCD - pixel of 9x9 microns). The CCD is Peltier-cooled. For 768 pixels along the dispersion direction the mean reciprocal dispersion is approximately 1.4 A/pixel (1200 groove/mm grating used for this Vega observation) and 2.9 A/pixel (for an optional 600 groove/mm grating). We use 30 mm x 30 mm gratings from Edmund Industrial Optics with a 5000 A blaze (ref. NT46-077 for the 1200 g/mm and ref. NT46-077 for the 600 g/mm). The width of the grating is greater than the projected beam diameter for F/D telescope faster as 6.5. The grating is mounted on a rotating stage with a fine adjustment for center wavelength (it is possible to observe zero-order image for field identification and center the target). 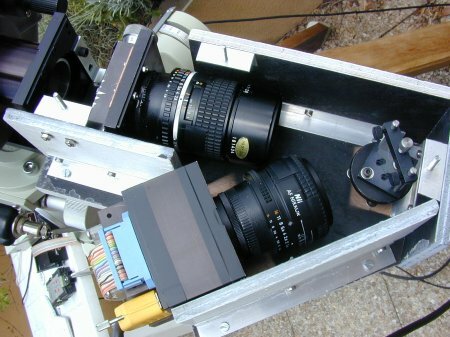 We use 35 mm photographic camera lens for the collimator and camera objective functions. The collimator is a Nikkor 135 mm focal length objective f/2.8 model. We select a Nikkor 50 mm f/1.4 model for the camera objective. The entrance aperture size of the lenses is matched to the diameter of the optical beam for unvignetting with a F/D=6.5 telescope. The distance between the grating surface and the entrance pupil of the camera objective is about 60 mm and the angle between collimator axis and camera axis is 38°. The entrance slit is adjustable by the use of a micrometer. Onto the telescope the spectrograph is mounted with its long slit oriented north-south (optimal for spectral resolution and flux consideration relative to the periodic error of the RA drive). The total spectrograph weight is of 3.1 kg (CCD camera included). The measured spectral resolution is 1900 @ 6000 A (i.e. 3.2 angstroms FWHM) for the 1.4 A/pixel dispersion (this present work) and 1000 @ 6000 A for the 2.9 A/pixel (i.e. 6 angstroms FWHM). The chromatism of the optical layout is reasonably low from 4500 to 6800 A. Refocus is necessary for spectral band outside this spectral range. For more information about the calculation characteristics and performances of MERIS spectrograph, click here. Note: The spectrograph is used at the focus of numerous instrument. For other view and some result with these setup, click here (ref1) and click here (ref2). The spectral data were reduced in the standard manner using Iris and VisualSpec tools (click here for exemple). The instrumental response function was removed from target spectra by using Pickles spectral flux library (A0V spectral type). The relative flux is normalized at the wavelength 6630 angstroms. The final spectrum cover the wavelength range 3820 - 10200 angstroms (nine individual spectra are added for cover this domain, representing 4226 pixels as long). Date of the observation: July 4, 2002 - Castanet-Tolosan (France).. The mean spectral sampling is of 1.4237 A/pixel. The wavelength of identified lines are extracted from precise tables. The lines noted H2O and O2 are telluric. Click on the image for enlarge. Click here for download this spectrum (file raw.dat). Click on the image for enlarge. Click here for download this spectrum (file vega.dat). 3800-5000 A domain. Click on the image for enlarge. 5000-6000 A domain. Click on the image for enlarge. 6000-7000 A domain. Click on the image for enlarge. 7000-8000 A domain. Click on the image for enlarge. 8000-9000 A domain. Click on the image for enlarge. 9000-10200 A domain. Click on the image for enlarge.